As so many writers have discovered, making money from writing is not easy, but self-publishing is a fantastic opportunity to get books published and available to readers all around the world. Self-publishing, however, also involves a very long learning curve that requires the acquisition of so many skills. So long, in fact, that writing a book often seems to be the easiest part of the process. Discovering that a book will not sell itself, new authors have to learn how to leverage the online world through social media, websites, blogs, advertising and promotion. All of these require at least a basic technical knowledge, and for those authors who are willing and eager to learn, they develop very good Internet and technical knowledge. In the process, many also discover that self-publishing leads them to publishing online. The two are by necessity intertwined. To be able to get the word out to the world about a book, the best means at an author’s disposal is always blogging. Writing articles that inform, entertain and attract attention is indispensable, as they are very easy to transmit to the world via social media and more importantly, are indexed by search engines. Getting people to take notice of a book is not easy, but getting people to read an article about a book or books is much easier. My passion for publishing goes back a very long time. 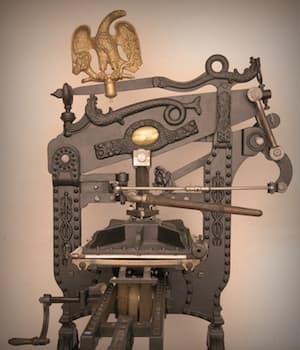 I started learning how to use a printing press when I was at high school, and then after, began my apprenticeship in the printing and publishing industry. One of the first presses I used was an Albion Press, which is pictured on the left and dates me somewhat. What fascinated me the most was the history. During my apprenticeship, I studied Johannes Gutenberg, Alois Senefelder and William Caxton and how the printing revolution started the modern period of human history. The advent of movable type changed the world forever, and with it came the challenge to the power of political and religious authorities. If there was a moment in time when the freedom to express one’s beliefs and ideas came to pass, the printing revolution was the time. Many, many years later, I sensed a similar historical change and challenge to the ruling elite when the Internet gave every writer in the world the technology to be published, and read. I am not talking about when ebooks arrived. It was well before that time when ezines or online magazines began, and then led to weblogs, which we now know simply as blogs. As I type away, I know that the words I am writing here will be read. By a few people at least, or perhaps by thousands. But my words will be read. That is why I am still passionate about publishing, and writing about it. Not every author who self-publishes a book or ebook is successful. It is the nature and fact of book publishing that very few books sell well. It’s a lottery. But this should not dissuade authors from continuing to publish. One of my favourite ways to demonstrate how book publishing success works is to mention the name, William Golding. If you know the name, you will know that he wrote a very famous book, Lord of the Flies and was also a Nobel Prize winner. However, he wrote almost twenty other books, but few people can name one of them. Unlike William Golding, writers and authors today have the tools at their fingertips to write and be read in so many different ways. So if writing books is not bringing the financial rewards you might have hoped for, there are many other ways to make money from your writing. Sure, keep writing books, and like Golding, one might become your Lord of the Flies. But while you wait, look for ways that you can leverage the tools at your fingertips to add to your writing income. There are so many opportunities for writers today. Ghostwriting, online content writing, freelance article writing, guest writing and professional blogging just to name a few. All of these are income producing and are not dependent on making sales on Amazon, Apple and Kobo. They don’t even involve advertising and promotion time and expense. Yet, they are all still facets of publishing. There are two choices when it comes to making money from short-form or article writing. The first is to write for others and sell your articles, and the second is to publish yourself and monetize your site. You can make money from article writing in two basic ways. One is to get someone to buy an article, and the other way is to write for sites for free, but include one or two affiliate links within the text to earn income. It is quite easy to find sites that accept content writers by doing a Google Search for ‘Write For Us’, as this is usually the title of the page on most websites that are looking for guest writers. For writers new to content and article writing, guest writing for sites and blogs with a lot of traffic is the best place to begin. It doesn’t involve any investment other than time and can produce an income stream relatively quickly. The other option is to build your own site and publish your articles. However, it takes a long time to build a new site or blog and then to make it profitable. For this reason, many writers choose the first option and write for others to get started. If you look at the footer at the very bottom of this page you will see the disclaimer on this site and how it earns income. So, this tells you what method I have taken. While my site is now earning its way, it took well over a year to build up enough traffic to be able to cover the set-up and ongoing expenses involved and to turn a profit. It involved a lot of writing, a lot of time and quite a financial investment. But now that the hard work of the initial set-up has been done, the site is now growing steadily. In recent months I started accepting guest writers, and this has helped tremendously in broadening the range of ideas and opinions on the site. While building a new site needs some business acumen, my pleasure is still derived primarily from writing. I am writing, and you are reading. It is still the primary reason why I love publishing, in any form. No matter how you use or plan to use publishing to take advantage of your skills, always keep in mind that there are so many ways you can make money from your words. If you want to make writing and publishing your career, it is absolutely possible today. As with any business, diversifying is always the best way to protect your earnings in the long-term. So yes, keep writing and self- publishing ebooks and books, but perhaps think about branching out into content and article writing as a way of making money from your writing. If you find some success, you could then look at starting your own site and developing it into a monetized blog. There has never been a better time to be a writer, but perhaps my parting words should be, don’t put all your (writing) eggs in one basket. Thank you for letting me know about article writing. I e-published my first book ‘The Hartnetts’ six months ago and I am currently preparing another for e-publication. What is the best way to get into article writing and how do I find out about people who want people to do it? Hi Tom. The way to get started in article and content writing is by searching for high profile sites that offer an invitation to write for them. By way of example, if you look at the footer section of our site, you will see a “Write For Us” link.